The following interview was done by Innocent Umezuruike Iroaganachi, a member of the Young Peace Journalists. It is the latest entry in the Young Peace Journalists project featuring the stories and voices of refugees. In recent times, Nigeria has been witnessing news about misconduct, maladministration and misappropriation in some Nigeria’s internally displaced persons’ camps (IDPs), especially in the north-eastern part of the country. 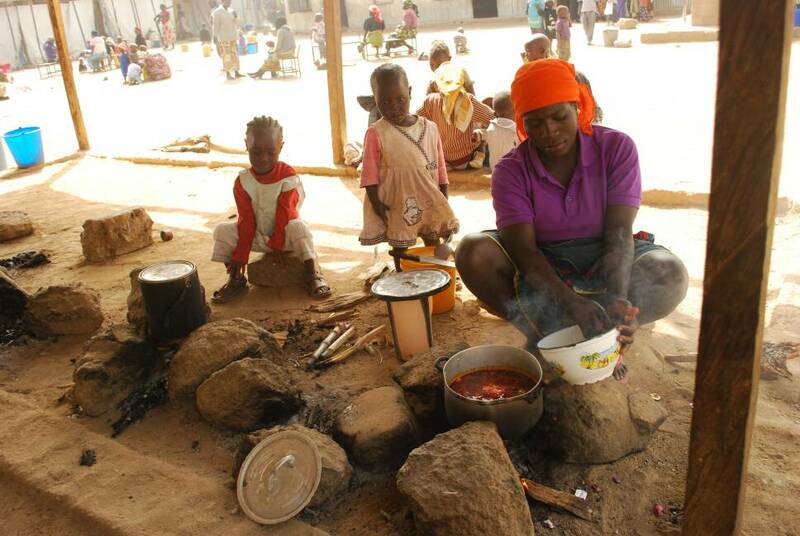 This interview gives a clear view of some ongoing experiences in a typical Nigerian IDP camp. It exposes the kind of administrative challenges; collective and individual sorrows, laughter, sadness, joy, fear and peace; and finally, the humanitarian achievements taking place in an IDP camp, in spite of Nigerian government abandonment. Focusing on Bukuru IDP camp in Jos South Local Government Area of Plateau State, Nigeria (in West Africa), Sr. Antoinette O’Callaghan of the Sisters of the Infant Jesus, a Catholic female religious congregation, shares her experiences with Innocent Iroaganachi, a Peace Journalist with Pax Christi International. This interview was made possible through the aid of Sr. Virginia Shuaibu. Innocent: What motivated you to assist in taking care of displaced persons? Sr Antoinette: We heard every day of the atrocities in the North-East. We could do nothing about it. Then one month after the camp opened, a man from our parish took us to the Camp in Bukuru. At that time it was full, over 700 people packed into a disused building of a local secondary school. Initially we could do nothing, there were too many. All the local Churches brought food and blankets etc. After two months we knew we had to do something as there were hundreds of children, no school, and no word of English. We went not because we were Catholic nuns but because there were children in need. If we could do nothing else we knew we could teach them. What in particular are some of the causes of displacement that the IDPs shared? Most of the people in our Camp were from villages in Gwoza Local Gov Area of Borno State. Their villages had been attacked repeatedly. People ran through the bush, families were separated. Some went over the border to Cameroon, others went to Mubi, then Yola and finally ended up in Plateau State. We have one widow and her son (father was shot by Boko Haram as they fled). Her extended family are in Cameroon and her youngest child is with them. She hasn’t seen him for three years. All our families share the experience of having to run through the bush, not knowing where they are going to end up. They leave with nothing. One man who had a large farm and his Diploma in Accounting fled through the bush, ended up in Jos, with absolutely nothing, totally dependent. He described for me how back home, he was the one, who after the harvest would take food to those in the village who didn’t have. Now he is totally dependent on what is handed in by charitable organizations. What are the routine activities taking place in the camp you assist? We work in one camp, Bukuru IDP Camp. It is run by a group called the Stevenson Foundation. They have developed many activities over the years. Many of the children have been taken to another part of Jos where they are in what seems like a boarding school. They come back to the Camp only for midterm and holidays. The Foundation has linked up with other organizations who have helped them build temporary classrooms and employ teachers. A few of the IDP’s have been employed in the Camp. Many of the men find work locally on building sites, security, selling in the market etc. The women all go out looking for casual labour, example: washing clothes, plates, farming, etc. The Foundation also ran courses for the women, that is, three month course in sowing, knitting, making pomade, etc. Many were given sowing machines. The people are very industrious and want to work but when they came first the local market people did not allow them to sell as they themselves were struggling. What are the personal difficulties faced by displaced persons in the camp? The difficulty in Camps is that people are “waiting”. It’s like being in a motor park – waiting, or a hospital, waiting. You don’t know what is going to happen next. Will food come? Will they get money to meet their meager needs (medical needs are particularly difficult)? Will they travel? Would things be better in another camp? Waiting is an extremely difficult situation to be in, and it undermines everything. What are the situation of young people and children in the camp? Any provision for their education? Many children have been sent to a boarding school run by the same Foundation. This is good for their education but it is very difficult for children who are traumatized and some very young, to have to leave their parents again and go to “school”. What we notice is that life is extremely unstable, insecure and unpredictable for the children. They have no idea if they are here for six months or two years. They are moved to different educational establishments. They have no idea what is happening to them. What is common to all (the children and young people) is that they all want to go back to Gwoza, even if the education they receive there is not as good as Jos! 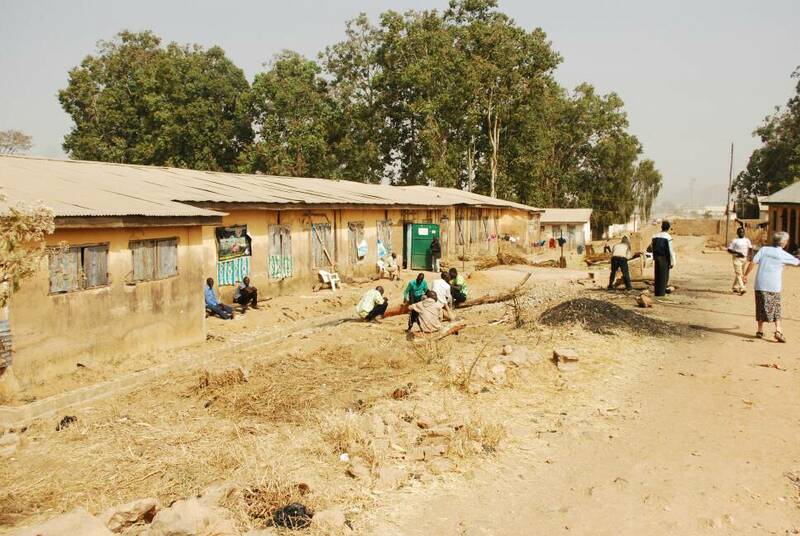 Can you describe the conduct of teachers and others who take care of IDPs, especially in this makeshift schools? Classrooms have been set up in the Camp and teachers are employed. We go there three times a week. We make sure they have books, writing materials etc. But the most important things is to get to know each one, listen to them, and give them special attention. We teach the group but we also try to give as much individual attention as possible. I think they know we care about them. How often do the government and non-governmental organizations visit this IDP camp and what do they do for the IDP’s during their visits? The Government does not give our Camp any formal support. It is a privately run Camp, so no formal funding from any government agency. A lot of funding comes from overseas, I think. People are constantly visiting the IDP Camp, and the Camp is totally reliant on what is handed in, in charity. But even this feels intrusive. People (those who visit the camp) come take photos, give speeches. If it is important visitors, all the people in the Camp have to be there and the ‘weariness’ and ‘depression’ is almost visible on their faces. Are there cases of segregation in the distribution of relief materials in the IDP camp; what could be the cause? I speak for one camp only. There is segregation when the management of the Camp is not good. The man in charge within (an IDP), was not straightforward. He favoured those from his own area and tribe. Staff took the best food and clothing for themselves. We became aware when we had a meeting for the widows and found out that they were always the last to receive what was donated. The men pushed to the top and women who did not have men to fight for them were left out. We then started giving them priority in whatever materials we got. Later that manager left and now the new man is extremely fair, tries to make sure that everything is evenly divided, but he himself is suffering. He is from a minority tribe and the others challenge his authority over them! Do occupants of the camp group themselves according to ethnic or religious affiliation? In our Camp, occupants do tend to group themselves along ethnic lines, and one group is suspicious of the other. All our people are Christian. And many said: “they came to this camp because they could not live close to Moslems again”. In the past many were intermarried in Gwoza but now they say there is no going back living close to one another. What are the possible activities in the camps through which displaced persons socialize and build good human relation among themselves? People have their Zumuntan matan ekklisiya (Catholic Women Organisation), etc, men play drafts all day! From what I see, people are crammed into tiny spaces. Their rooms are dark, sectioned off parts of classrooms, only blankets to separate one area from another. Tension can run high and so people keep a certain distance. They have to. I haven’t seen any socializing. What are the particular programmes through which displaced persons are equipped with skills for self-sustenance? They (women) have had training in sowing, knitting, I haven’t seen any training course for men, but they are usually out looking for work or they are in other parts of the country. Sometimes they go to Mubi or Yola and rent a piece of land where they can farm. They cannot get land in Plateau and most of our people are farmers. A lot more is needed to assist this people, especially from the government. Innocent Umezuruike Iroaganachi is a graduate of communication studies from the Centre for the Study of African Culture and Communication (CESACC), in the Catholic Institute of West Africa (CIWA), Port Harcourt, Nigeria. He is a member and a video journalist with the World Catholic Association of Communication (SIGNIS). He is currently a co-administrator and tutor at a high school in Aba, Abia State, Nigeria. Currently, Innocent is a Peace Journalist with Pax Christi International.